Edwin San Juan, one of the “original” Los Angeles based comedians, is well received from multicultural audiences of all ages, both internationally and at home. He has entertained our troops with the ‘Around the World in Eight Days’ USo campaign and has appeared on multiple Showtime Comedy Specials, such as ‘Edwin San Juan Presents, Pacific Rim Comedy’. Where he serves as creator and executive producer, showcasing some of the funniest Asian comedians out today! He also had over a million hits on youtube, making it one of the most requested clips amongst comedy fans around the world! Edwin has made several television appearances on multiple networks such as Comedy Central, ABC, UPN, NBC, BET, and Si TV. His appearances include ‘Live at Gotham’, ‘Latino Laugh Festival’, ‘Inside Joke’, ‘Destination Stardom’, and he reigned as the Grand Champion of the ‘Talent Agency’ with 9 consecutive victories. Be on the look out for this rising star’s, soon to be released, one hour special and his first movie venture, the hilarious comedy ‘I`m Not Like That No More’, co-starring Paul Rodriguez and Felipe Esparza. In need of a laugh on your night off from work? In Vegas for the weekend and can't decide what to do? 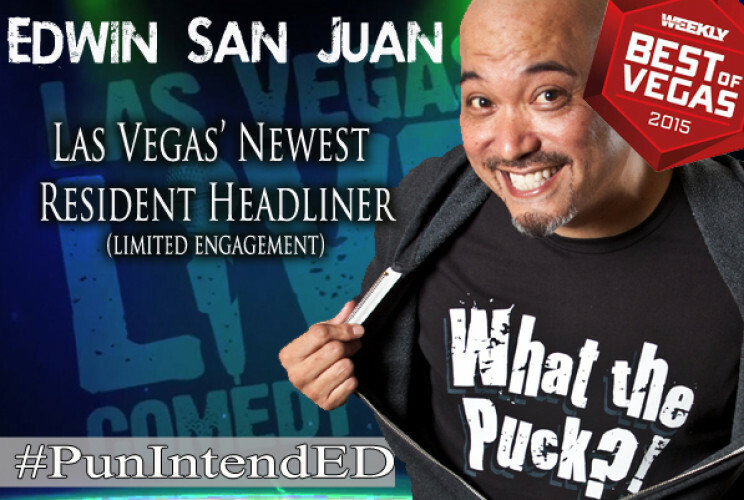 Come see headliner Edwin San Juan and some of the top comedians in the country perform at the Las Vegas Live Comedy Club. The Las Vegas Live Comedy Club is located in the Miracle Mile shops, inside the Planet Hollywood hotel and casino. From HBO, to SHOWTIME, to Comedy Central, these comedians came to the Las Vegas Strip to make you laugh, every night! You can't see all your favorite comics live, on The Strip, anywhere else! Purchase your tickets now to see the best of the best in the country perform at the Las Vegas Live Comedy Club and learn some new jokes to tell all your friends!